Topic 1-2: The Design Process (4 hours) Topic 1-3: Social/Environmental Considerations (2 hours) Topic 1-4: Design in Fabrication (2 hours) Topic 1-5: Careers in Design (1 hour) This unit introduces students to the engineering design process and provides the basis for the remaining units. Students will review the history of the design process and examine how it has evolved. 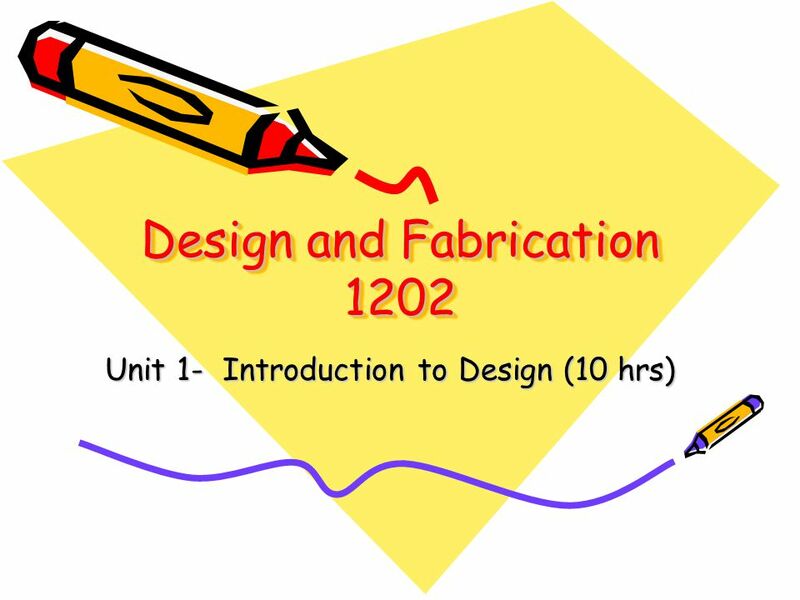 You will also examine various fabrication techniques and discover how design and fabrication are interrelated. 7 The design process has expanded into a multidiscipline approach that relies on people with varied disciplines and backgrounds. 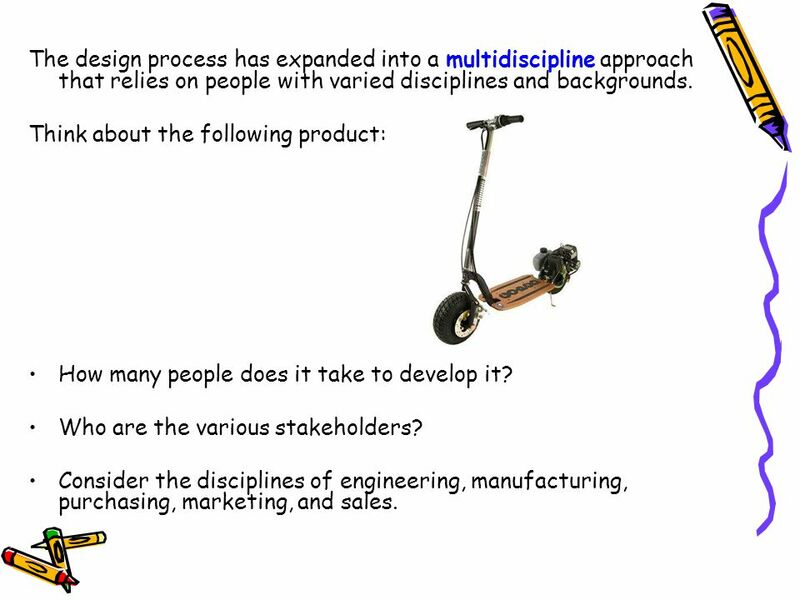 Think about the following product: How many people does it take to develop it? 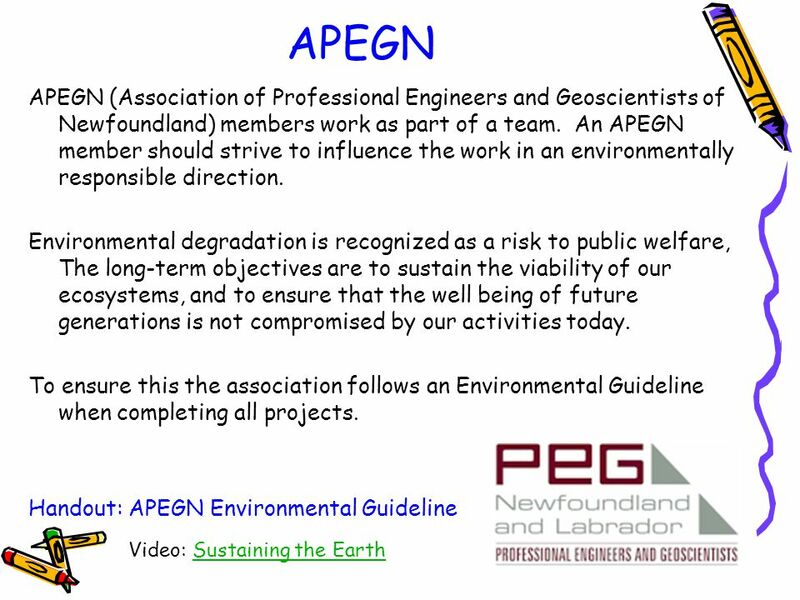 Who are the various stakeholders? 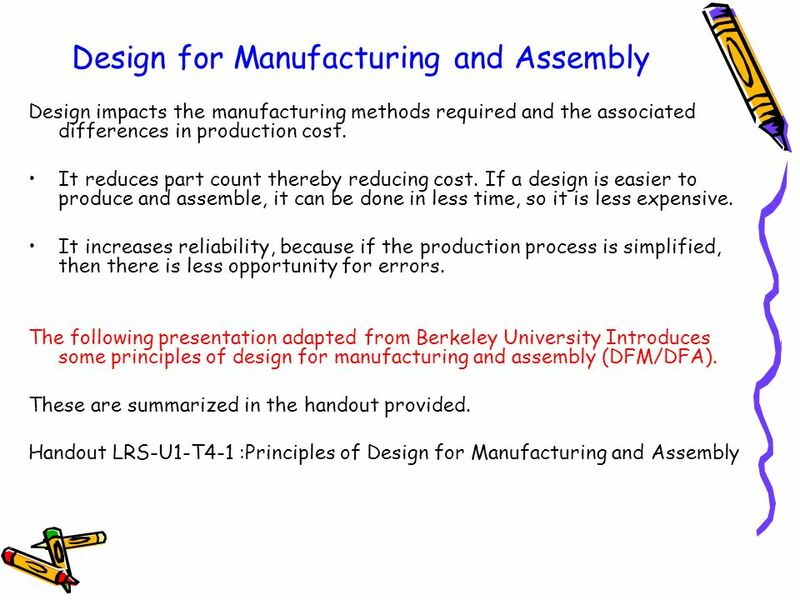 Consider the disciplines of engineering, manufacturing, purchasing, marketing, and sales. Explore the National Academy of Engineering’s list of the top 20 achievements 11. Highways 12. Spacecraft 13. Internet 14. Imaging 15. Household Appliances 16. Health Technologies 17. Petroleum 18. Laser and Fiber Optics 19. Nuclear Technologies 20. 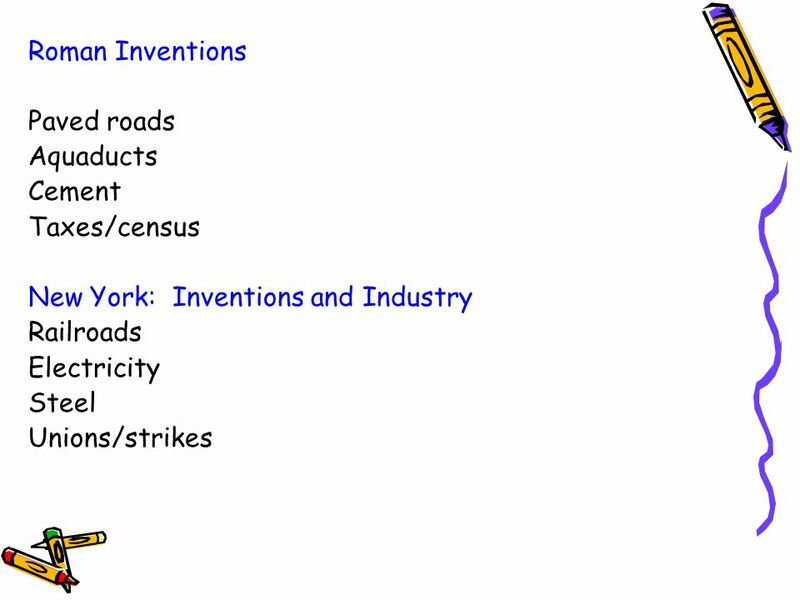 High-performance Materials 1 Electricity 2 Automobile 3 Airplane 4 Water Supply and Distribution 5. 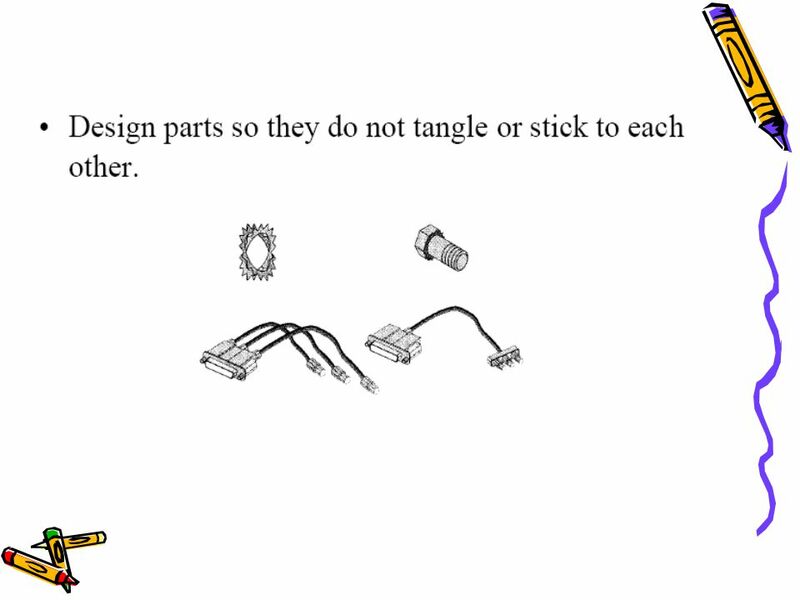 Electronics 6. Radio and Television 7. Agricultural Mechanization 8. 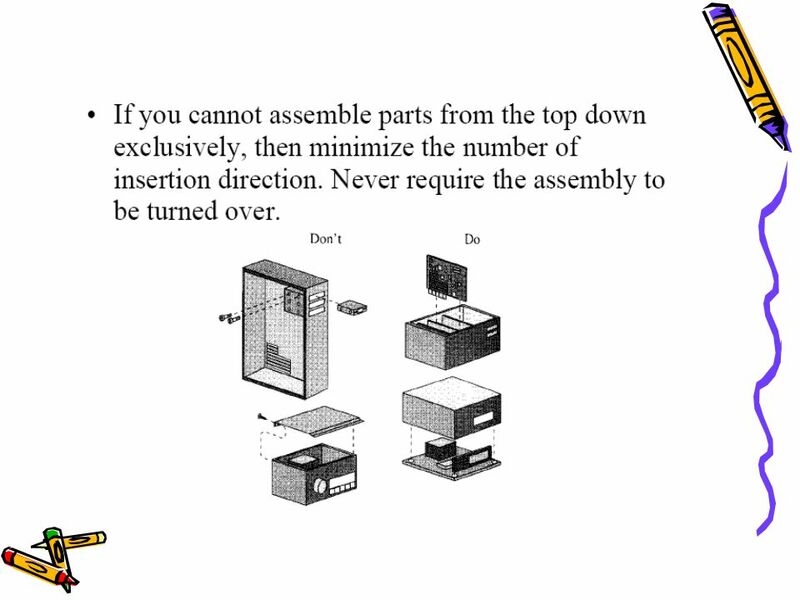 Computers 9. Telephone 10. 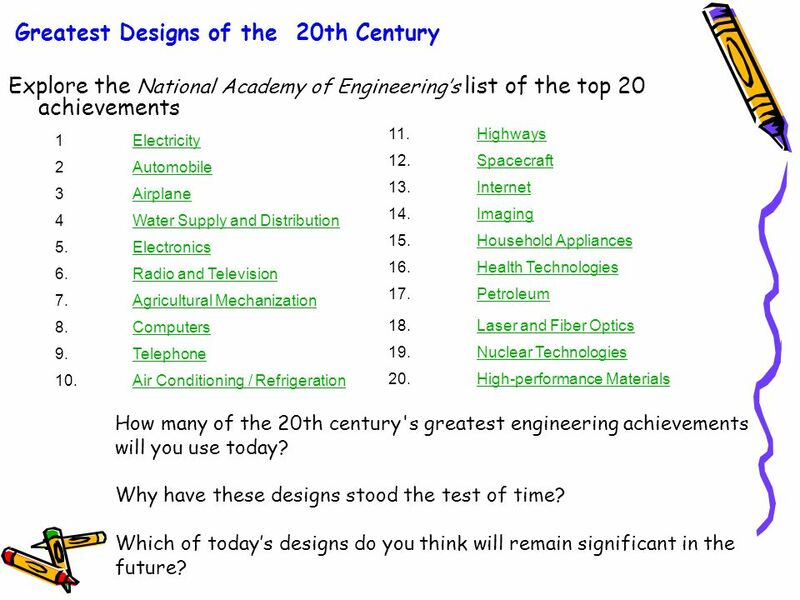 Air Conditioning / Refrigeration How many of the 20th century's greatest engineering achievements will you use today? Why have these designs stood the test of time? 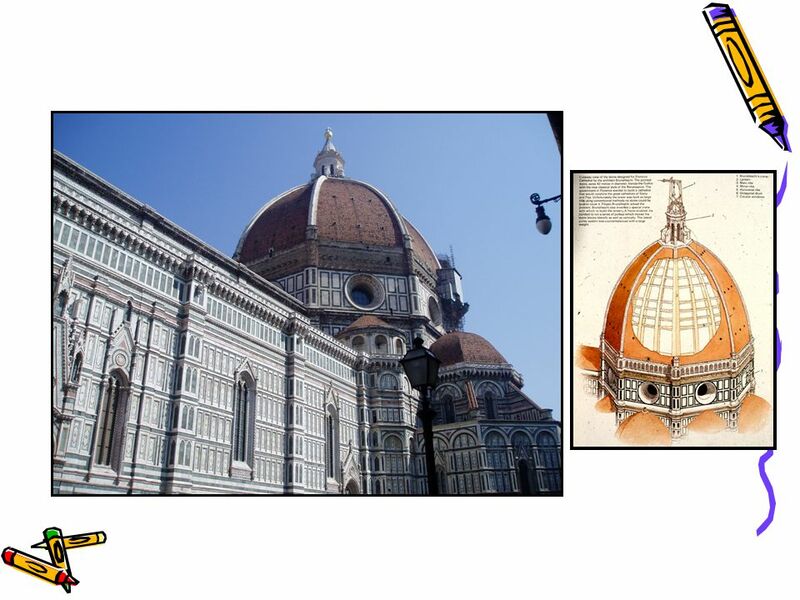 Which of today’s designs do you think will remain significant in the future? 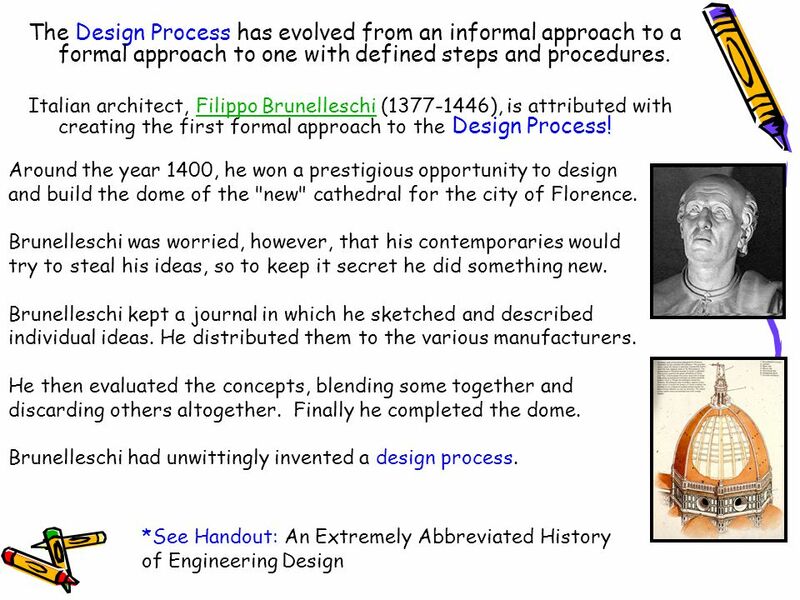 9 There are many historically noteworthy inventions and designs throughout history. 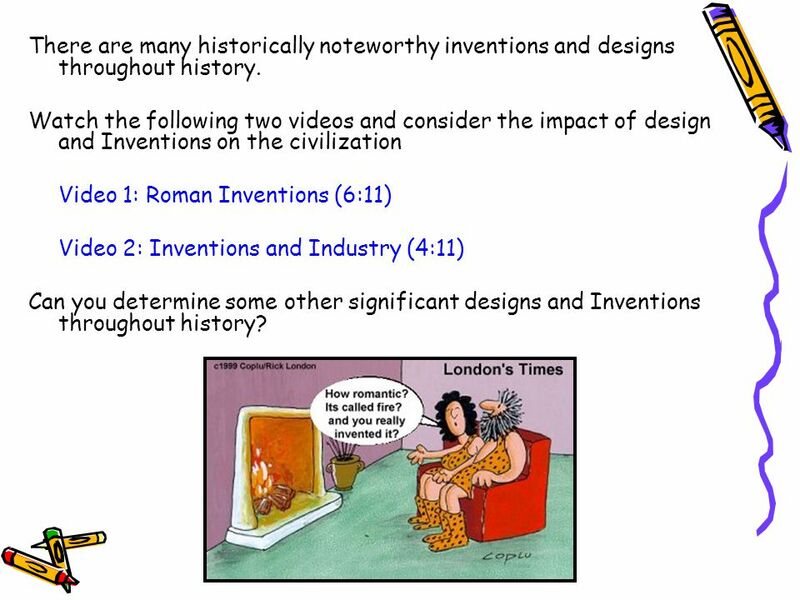 Watch the following two videos and consider the impact of design and Inventions on the civilization Video 1: Roman Inventions (6:11) Video 2: Inventions and Industry (4:11) Can you determine some other significant designs and Inventions throughout history? 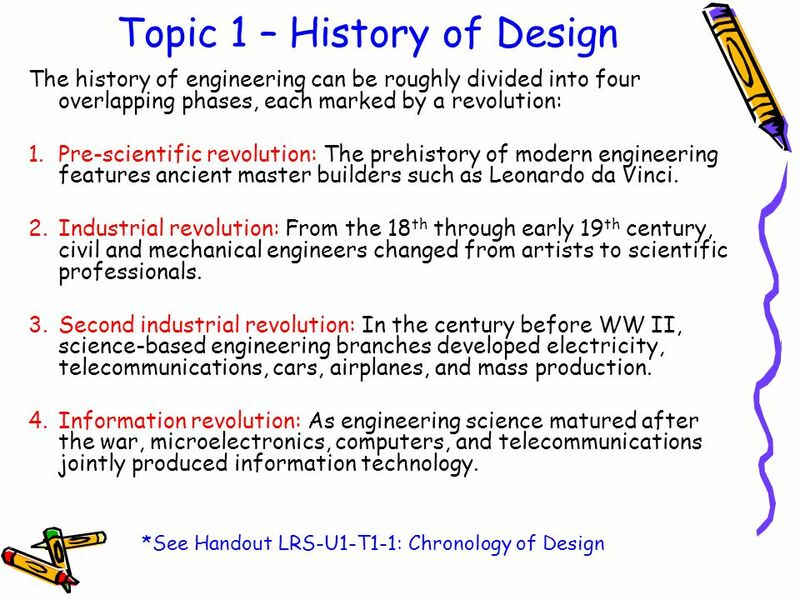 14 Before you begin Opportunities (Need Identification) Engineering design activity always occurs in response to a human need. 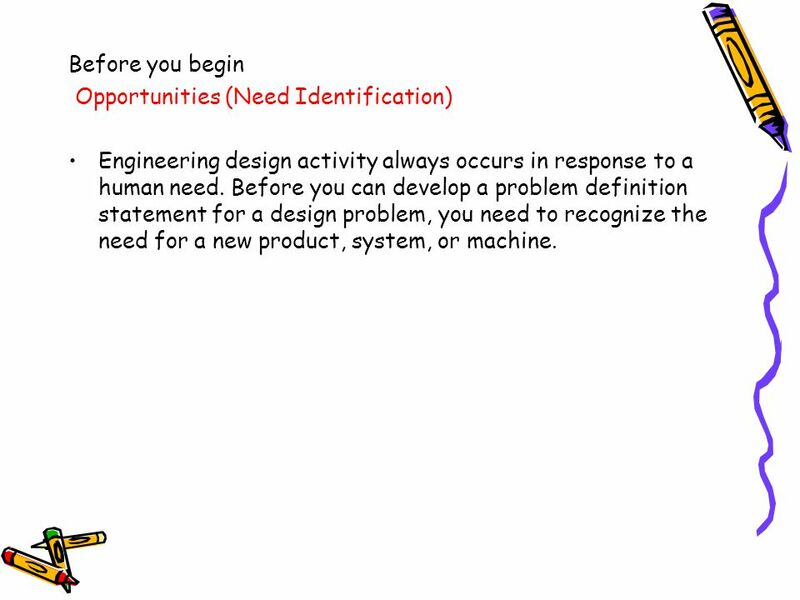 Before you can develop a problem definition statement for a design problem, you need to recognize the need for a new product, system, or machine. Before you can go further in the design process, you need to collect all the information available that relates to the problem. 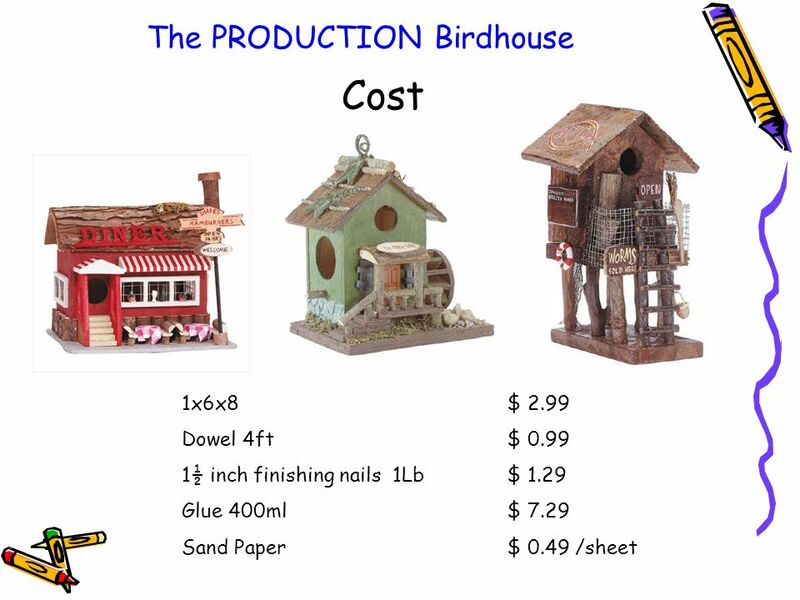 Consider the following: Suitable materials for your project. 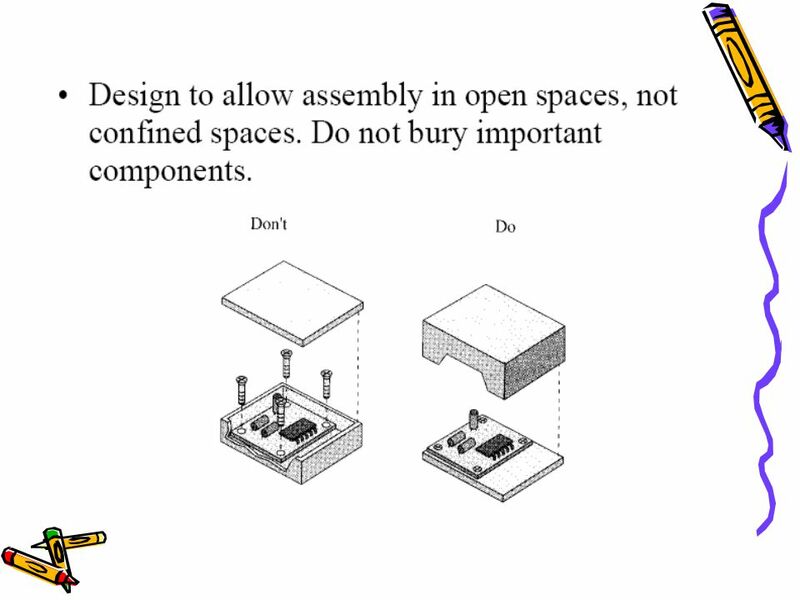 Safety factors related to your design problem. Write letters to manufacturers / shops. 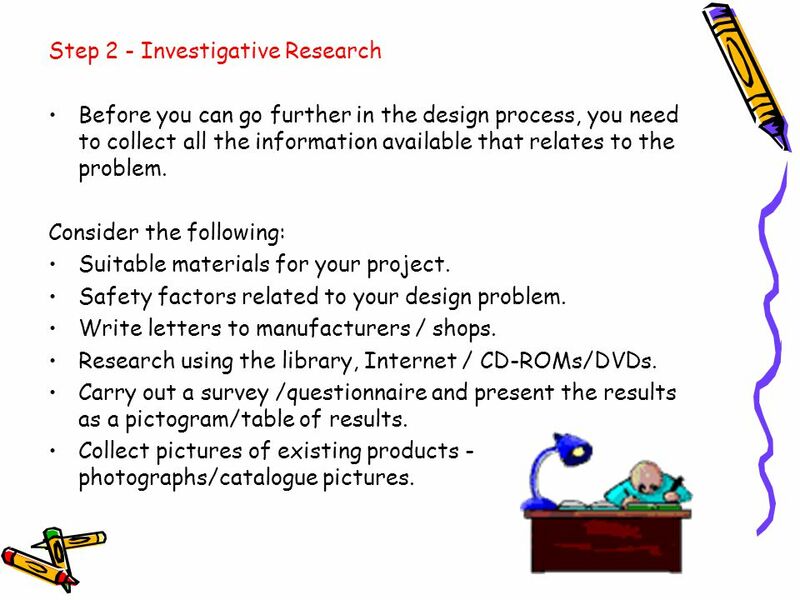 Research using the library, Internet / CD-ROMs/DVDs. Carry out a survey /questionnaire and present the results as a pictogram/table of results. Collect pictures of existing products - photographs/catalogue pictures. 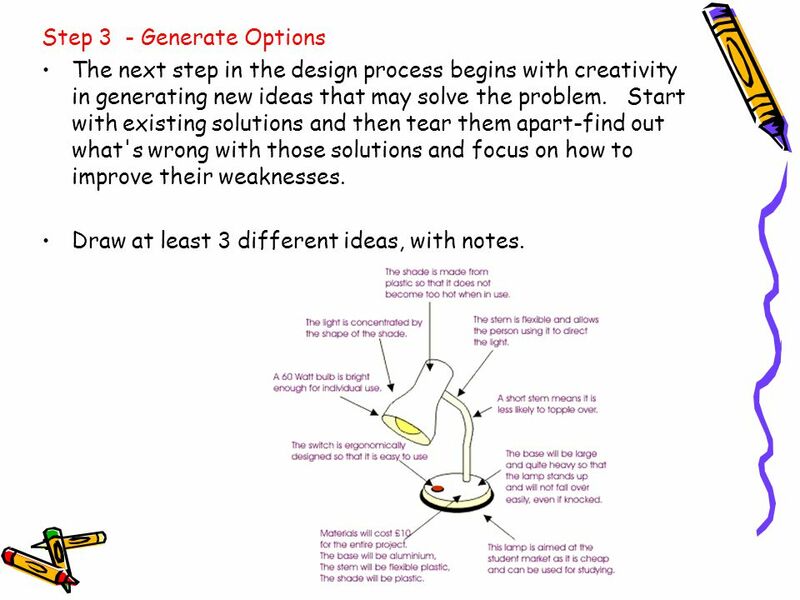 The next step in the design process begins with creativity in generating new ideas that may solve the problem. Start with existing solutions and then tear them apart-find out what's wrong with those solutions and focus on how to improve their weaknesses. Draw at least 3 different ideas, with notes. 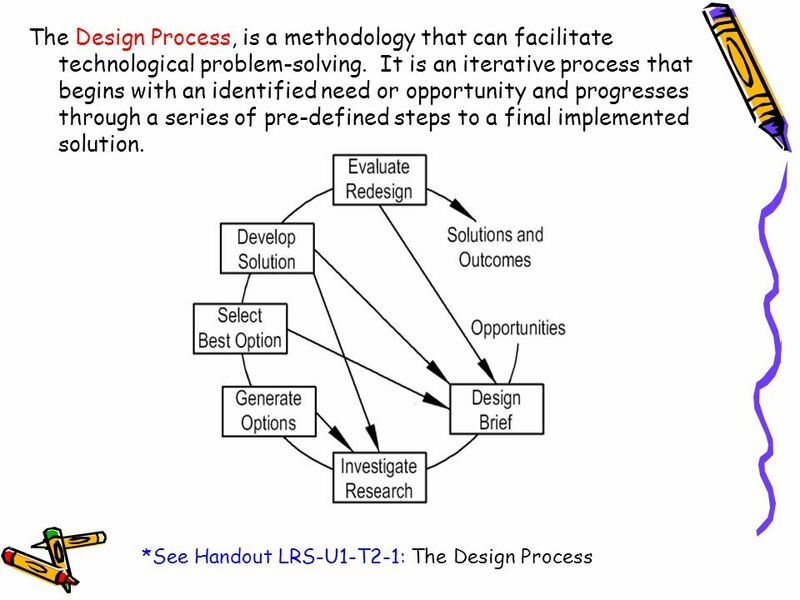 Once you've conceived alternative solutions to your design problem, you need to analyze those solutions and then decide which solution is best suited for implementation. 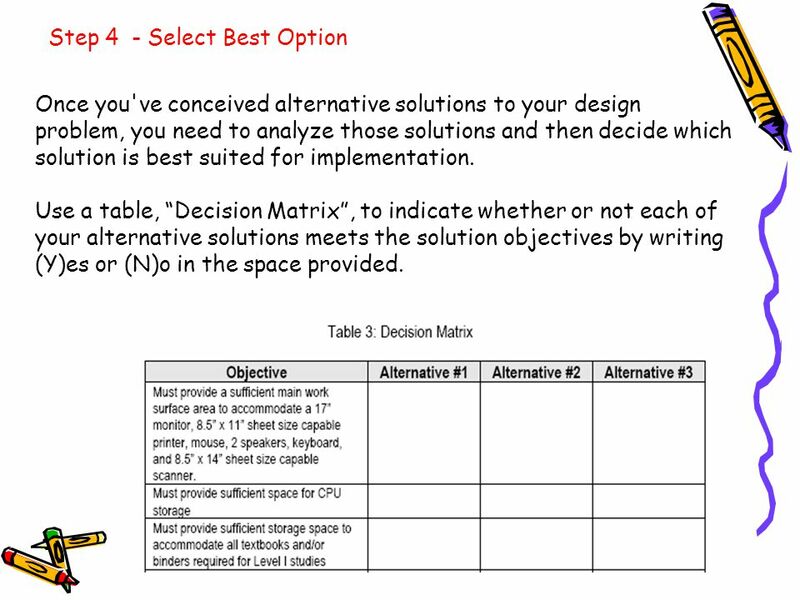 Use a table, “Decision Matrix”, to indicate whether or not each of your alternative solutions meets the solution objectives by writing (Y)es or (N)o in the space provided. 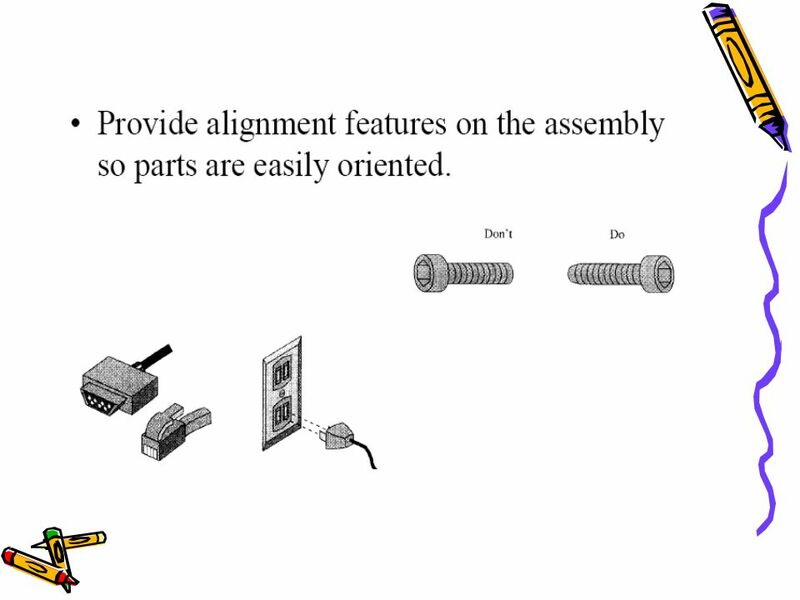 The best solution option is developed in detail at this stage. 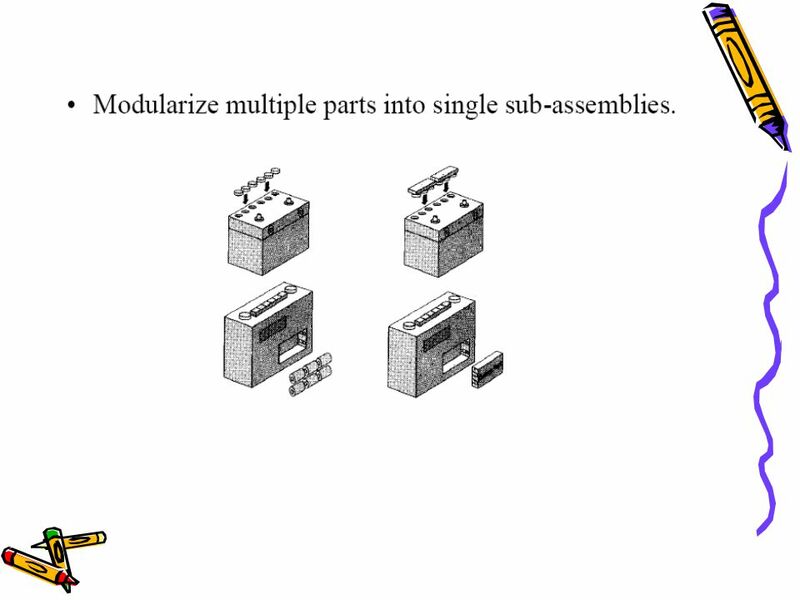 This often involves various engineering calculations and the development of detail and assembly drawings. 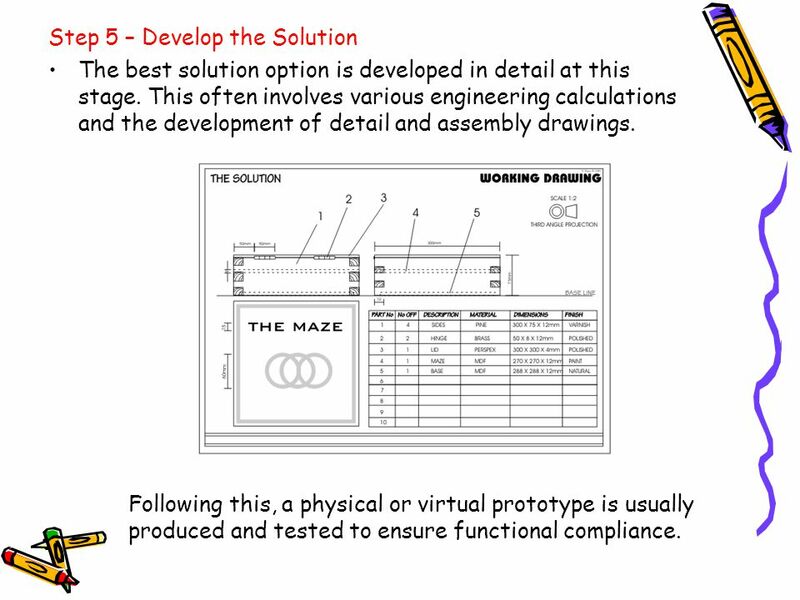 Following this, a physical or virtual prototype is usually produced and tested to ensure functional compliance. 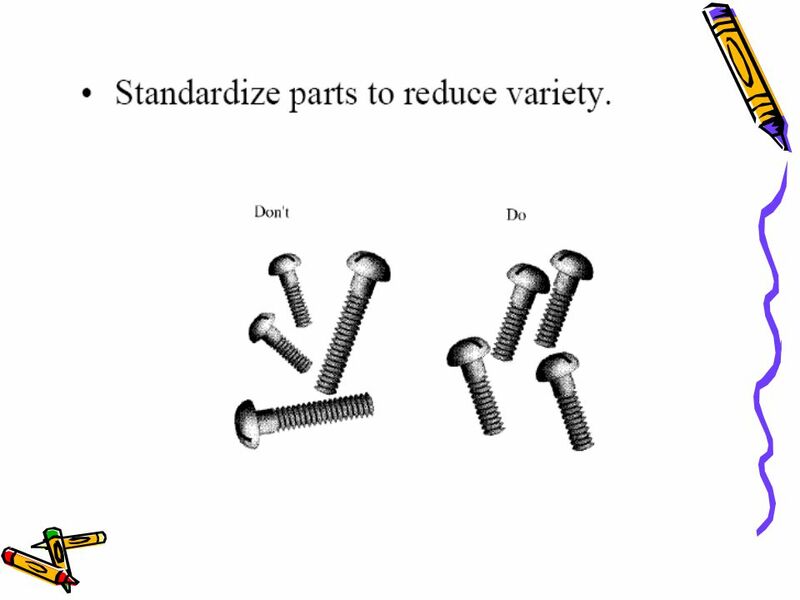 Evaluate your product. State the good and bad points. 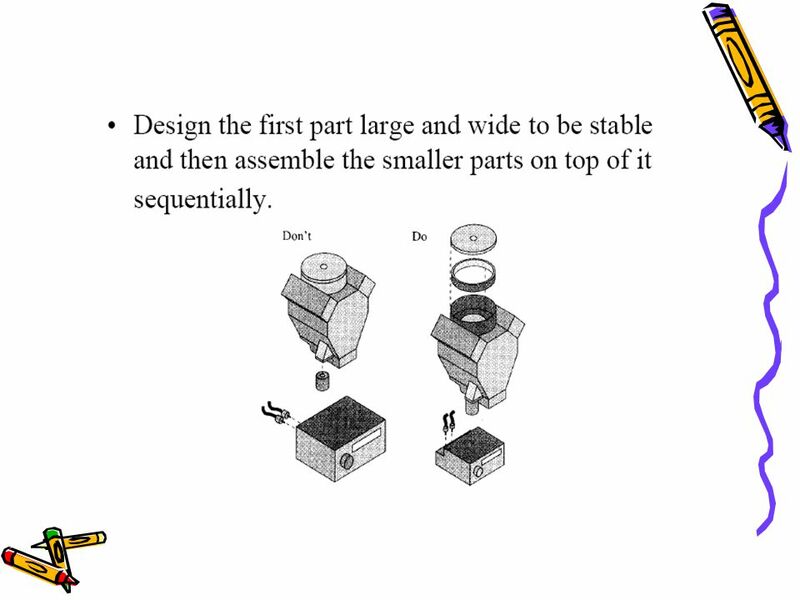 Does the solution answer the design brief ? 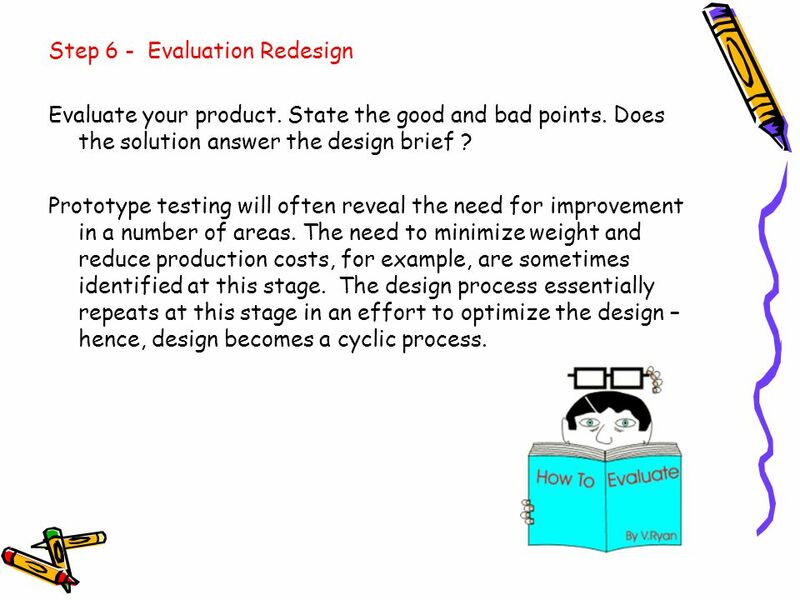 Prototype testing will often reveal the need for improvement in a number of areas. 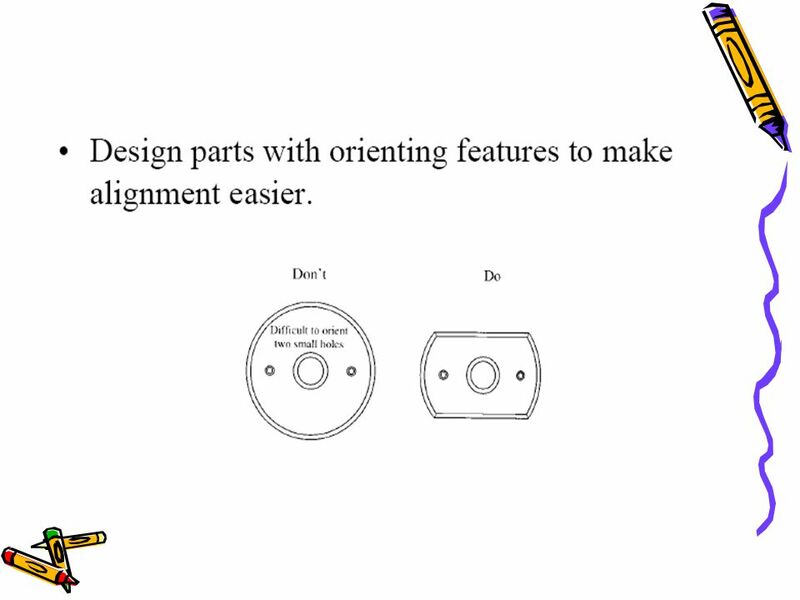 The need to minimize weight and reduce production costs, for example, are sometimes identified at this stage. 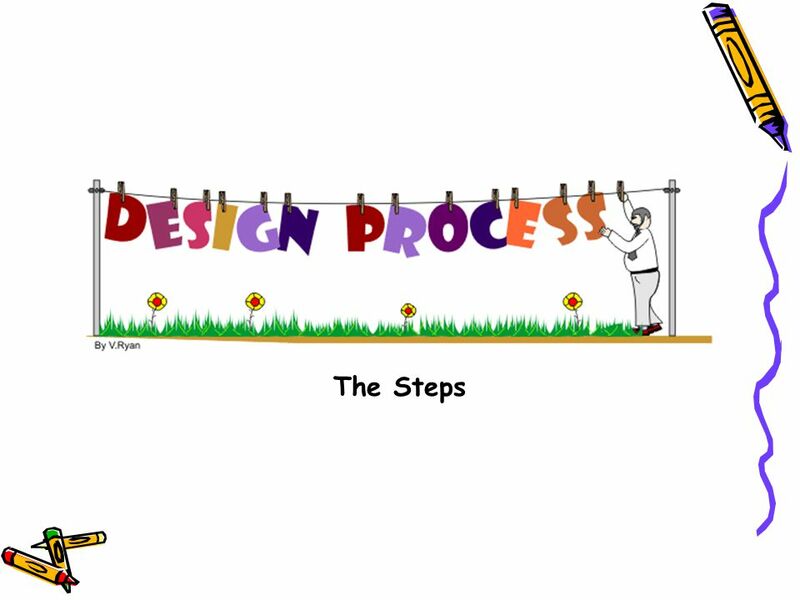 The design process essentially repeats at this stage in an effort to optimize the design – hence, design becomes a cyclic process. 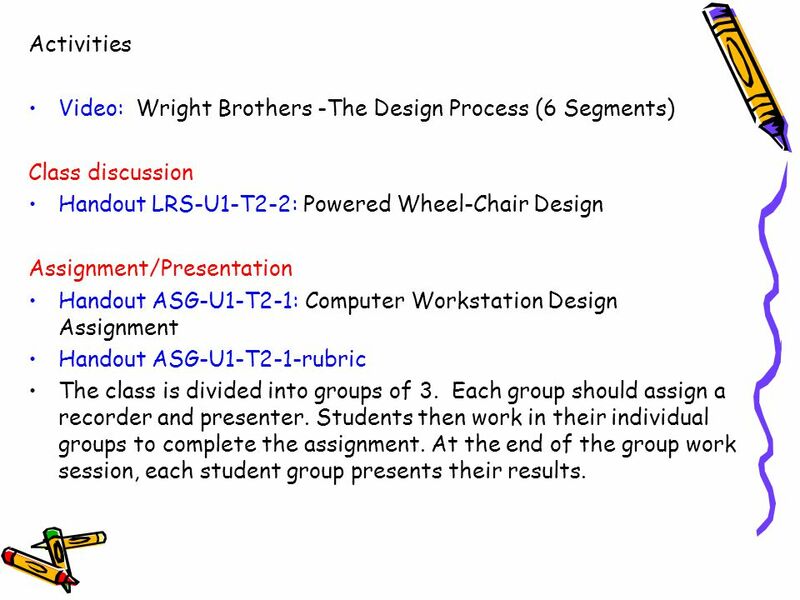 21 Activities Video: Wright Brothers -The Design Process (6 Segments) Class discussion Handout LRS-U1-T2-2: Powered Wheel-Chair Design Assignment/Presentation Handout ASG-U1-T2-1: Computer Workstation Design Assignment Handout ASG-U1-T2-1-rubric The class is divided into groups of 3. Each group should assign a recorder and presenter. 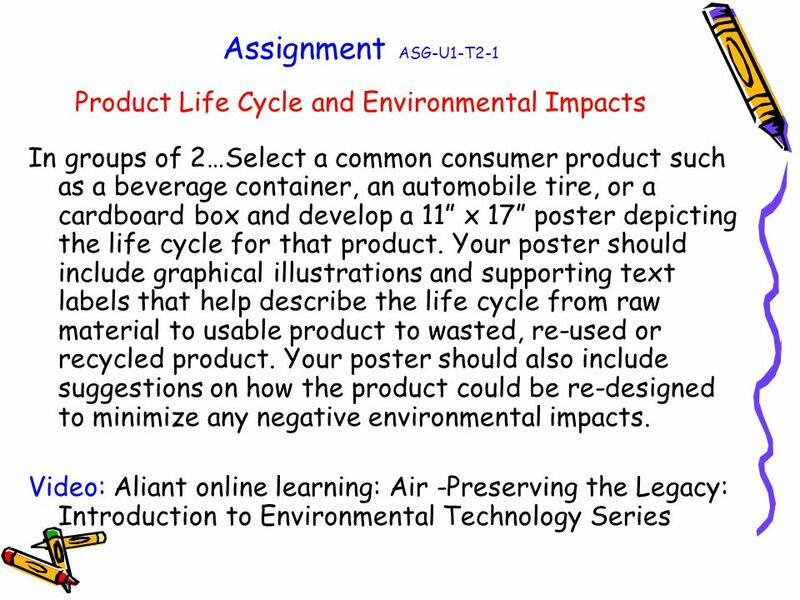 Students then work in their individual groups to complete the assignment. At the end of the group work session, each student group presents their results. 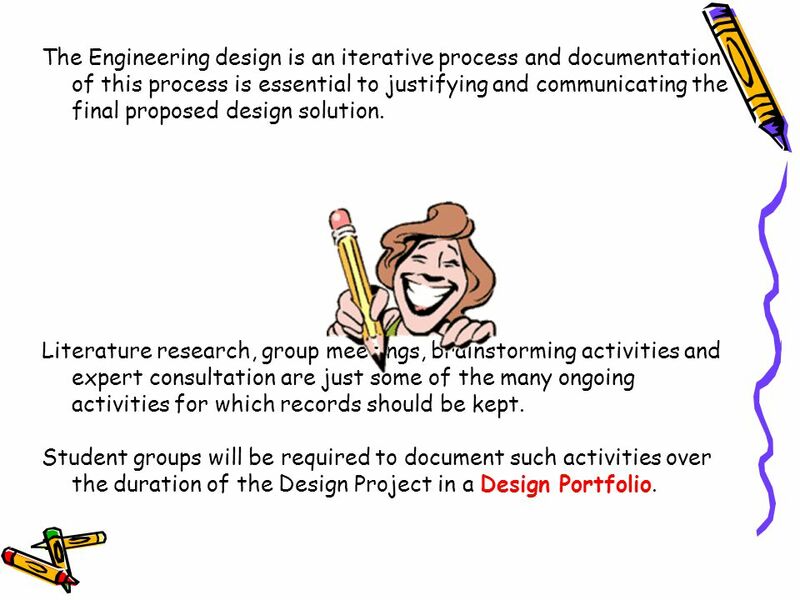 23 The Engineering design is an iterative process and documentation of this process is essential to justifying and communicating the final proposed design solution. Literature research, group meetings, brainstorming activities and expert consultation are just some of the many ongoing activities for which records should be kept. 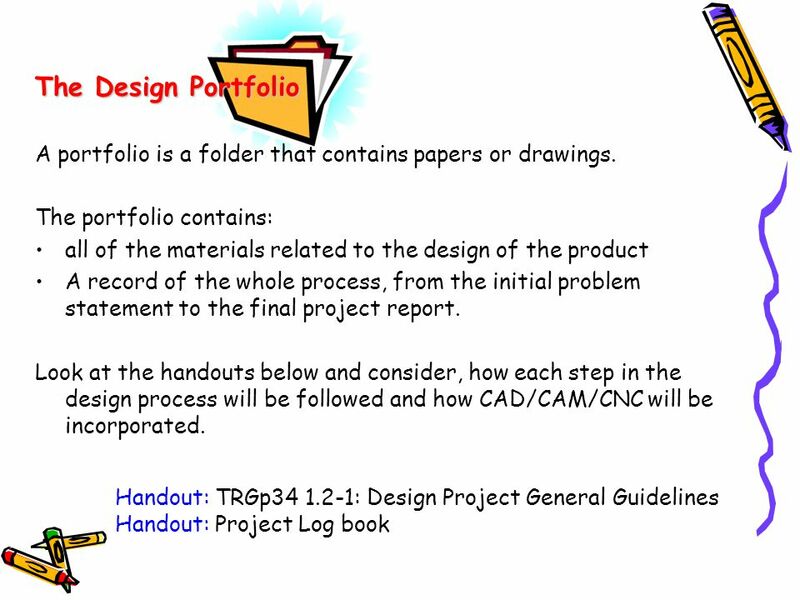 Student groups will be required to document such activities over the duration of the Design Project in a Design Portfolio. 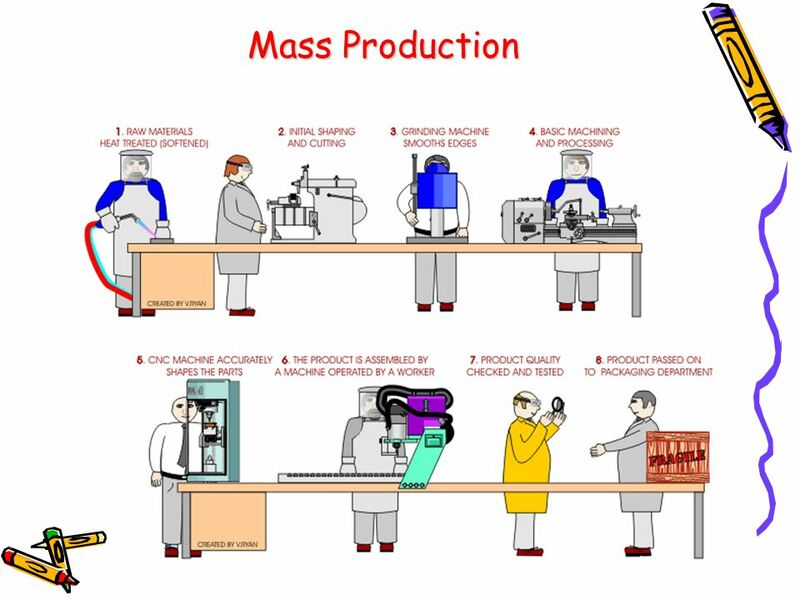 26 The production of common consumer products can have a considerable impact on society (health and the environment). These impacts can begin from the moment the raw materials are harvested, then processed into a finished product and to the point when the product is eventually disposed. 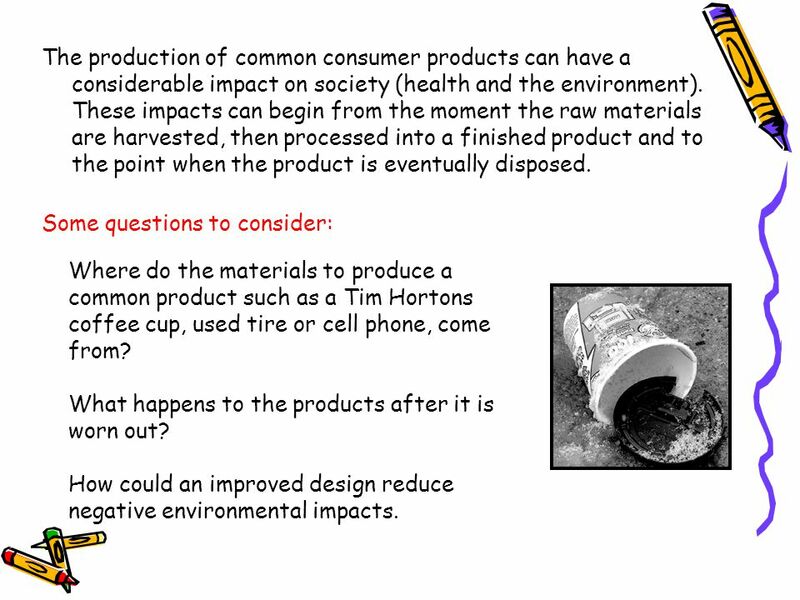 Some questions to consider: Where do the materials to produce a common product such as a Tim Hortons coffee cup, used tire or cell phone, come from? What happens to the products after it is worn out? 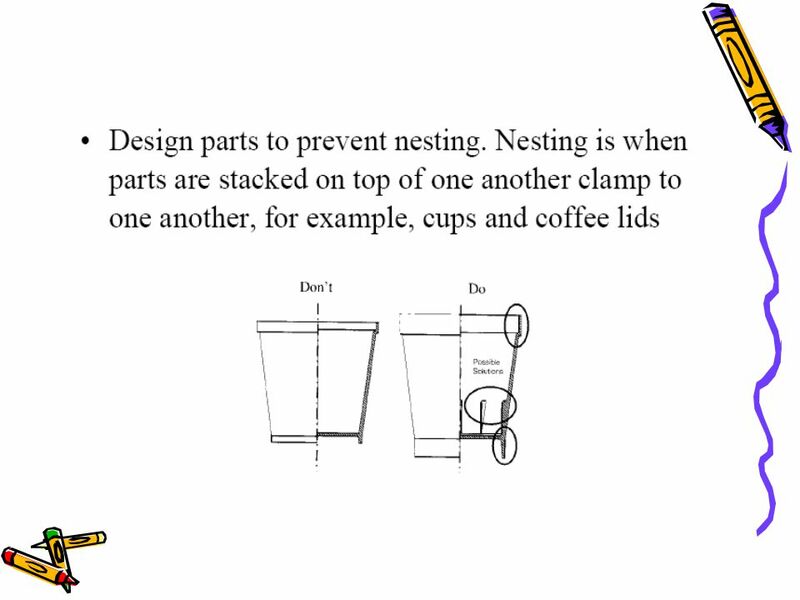 How could an improved design reduce negative environmental impacts. The computer you're using to read this will one day be nothing more than a pile of garbage, contaminated with heavy metals and toxic plastic. There's lead in the keyboard, toxic flame retardants and antimony in the circuit boards, cadmium in the battery and the chips, all wrapped up in a casing of plastic that will release more deadly substances – furans and dioxins – when it's burned. 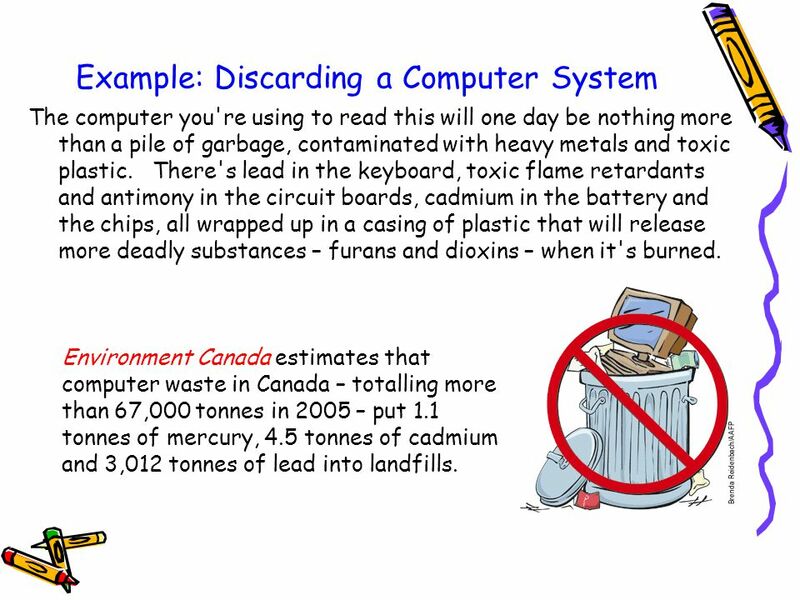 Environment Canada estimates that computer waste in Canada – totalling more than 67,000 tonnes in 2005 – put 1.1 tonnes of mercury, 4.5 tonnes of cadmium and 3,012 tonnes of lead into landfills. 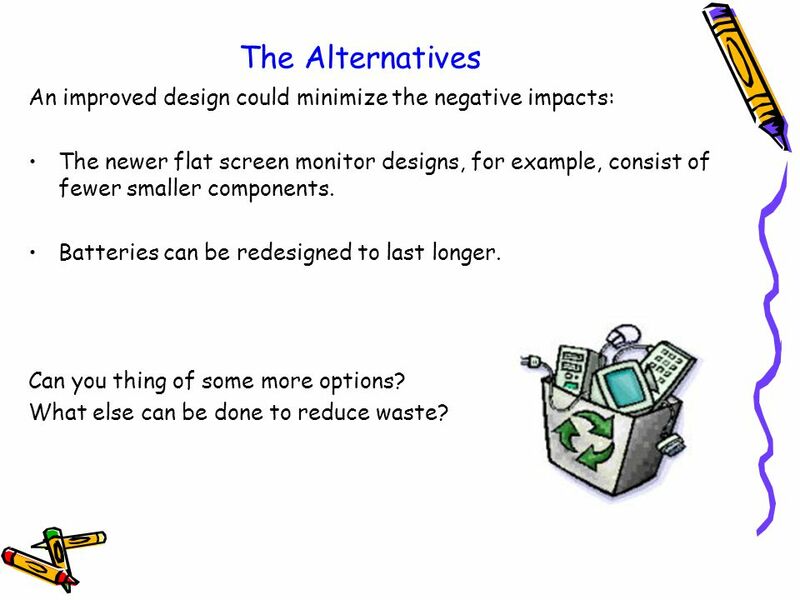 28 The Alternatives An improved design could minimize the negative impacts: The newer flat screen monitor designs, for example, consist of fewer smaller components. Batteries can be redesigned to last longer. Can you thing of some more options? What else can be done to reduce waste? 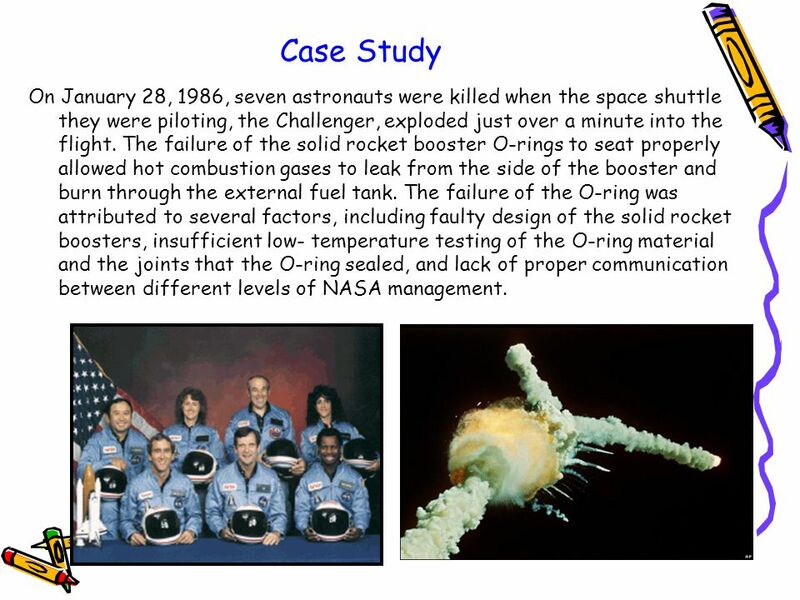 32 Case Study On January 28, 1986, seven astronauts were killed when the space shuttle they were piloting, the Challenger, exploded just over a minute into the flight. 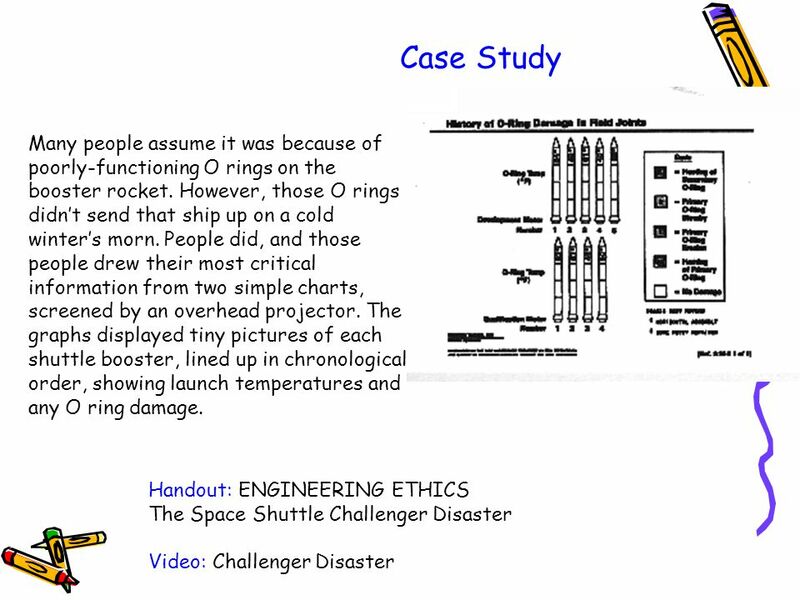 The failure of the solid rocket booster O-rings to seat properly allowed hot combustion gases to leak from the side of the booster and burn through the external fuel tank. 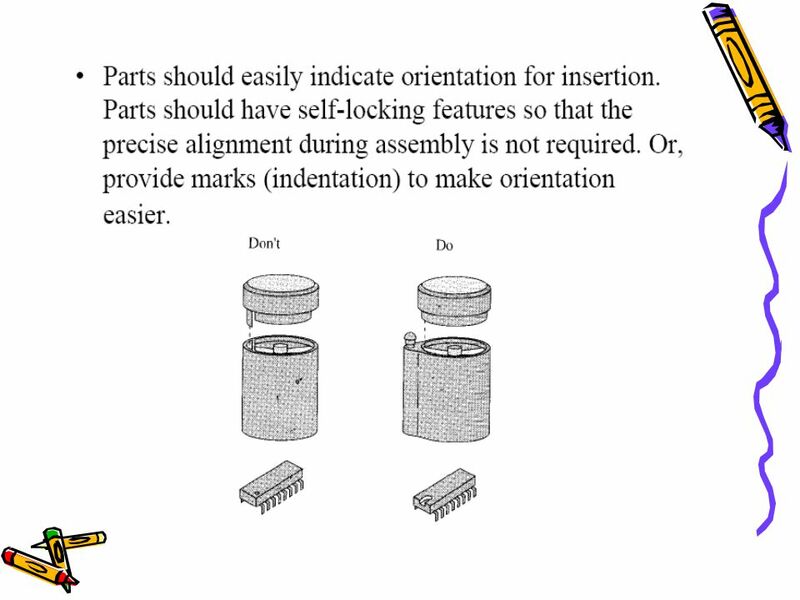 The failure of the O-ring was attributed to several factors, including faulty design of the solid rocket boosters, insufficient low- temperature testing of the O-ring material and the joints that the O-ring sealed, and lack of proper communication between different levels of NASA management. 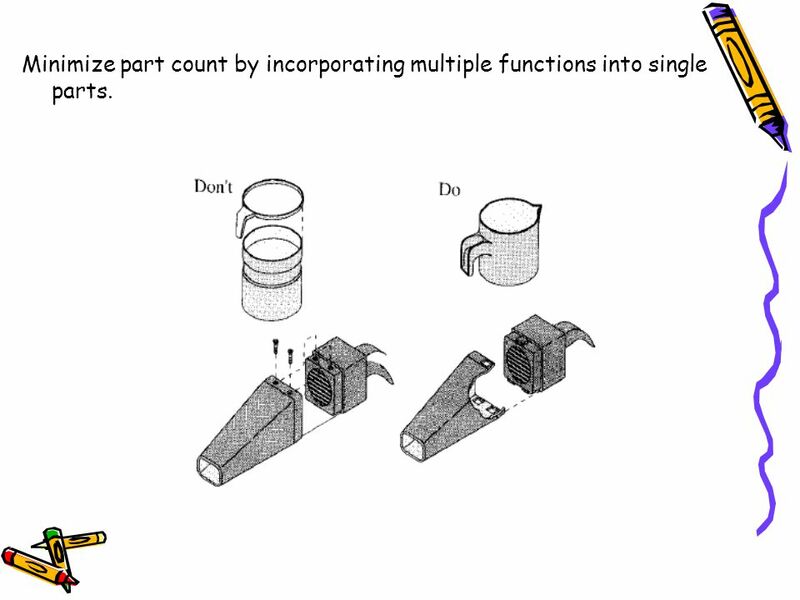 37 Minimize part count by incorporating multiple functions into single parts. 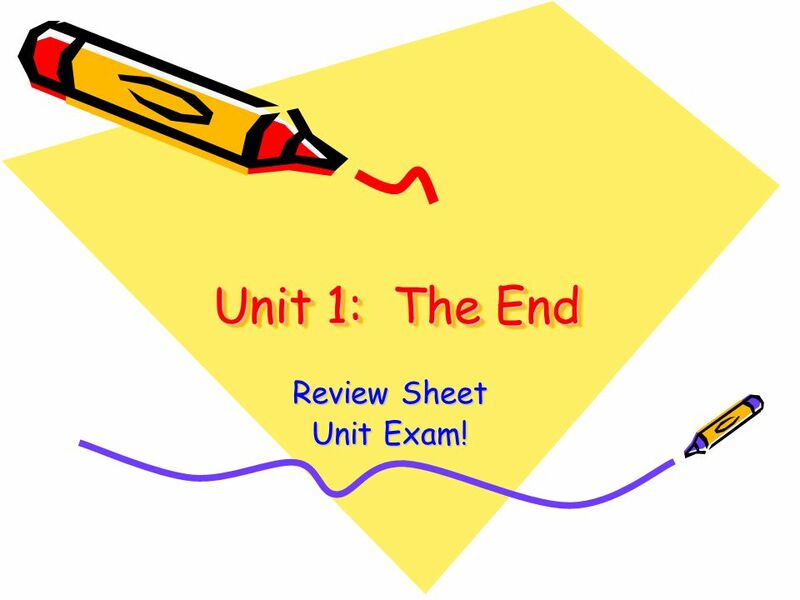 52 Unit 1: The End Review Sheet Unit Exam! 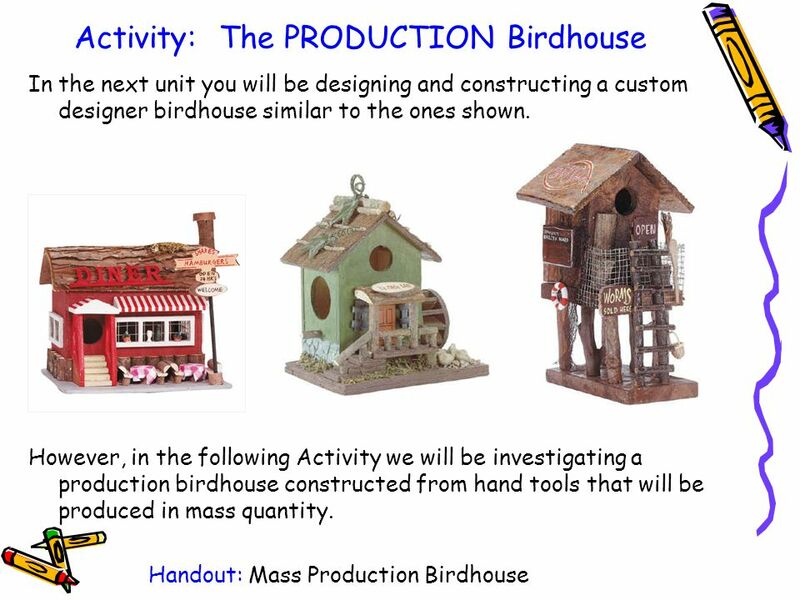 Download ppt "Design and Fabrication 1202"
Penshurst West Public School Stage 2: Year 3 This year Penshurst West celebrated its 50th Anniversary. All students K-6 have been involved in a variety. Quality Assurance/Quality Control Plan Evaluation February 16, 2005. © 2003 By Default! 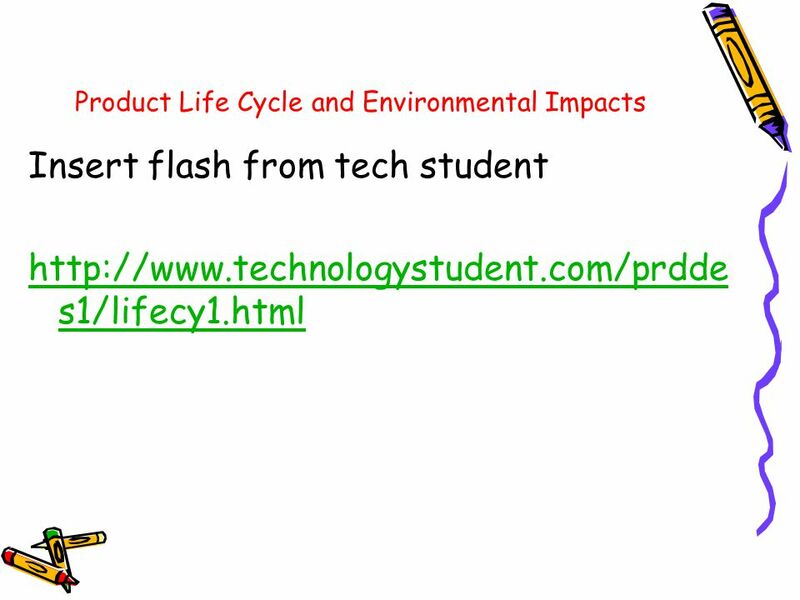 A Free sample background from Slide 1 A First Course in Database Management Jeanne Baugh Department of. 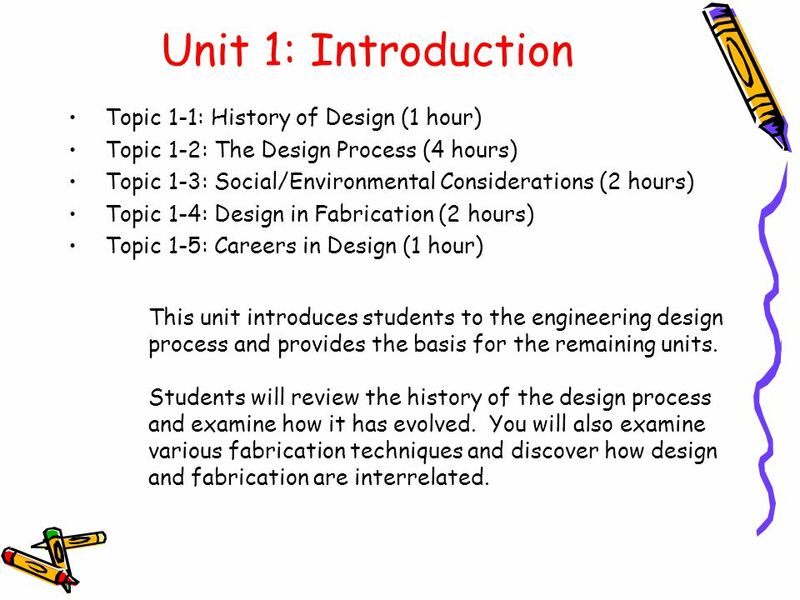 SituationGantt Chart Brainstorm:Design Brief Page 1 GCSE Product DesignYour NameCandidate Number. 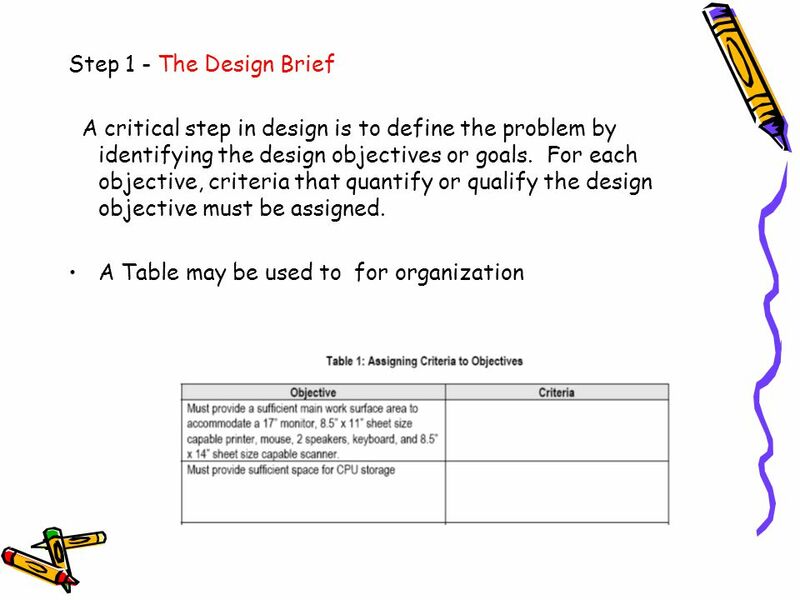 Steps of a Design Brief V Design Brief  Problem, identification, and definition Establish a clear idea of what is to be accomplished. Identify. October 21, 2009 DRILL Write each question and answer. 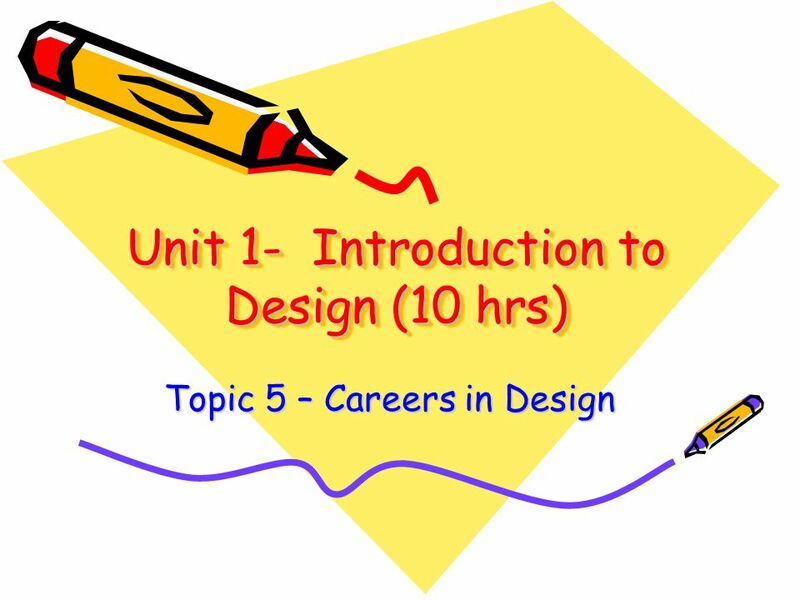 1.What is another term for a limit to the design process? 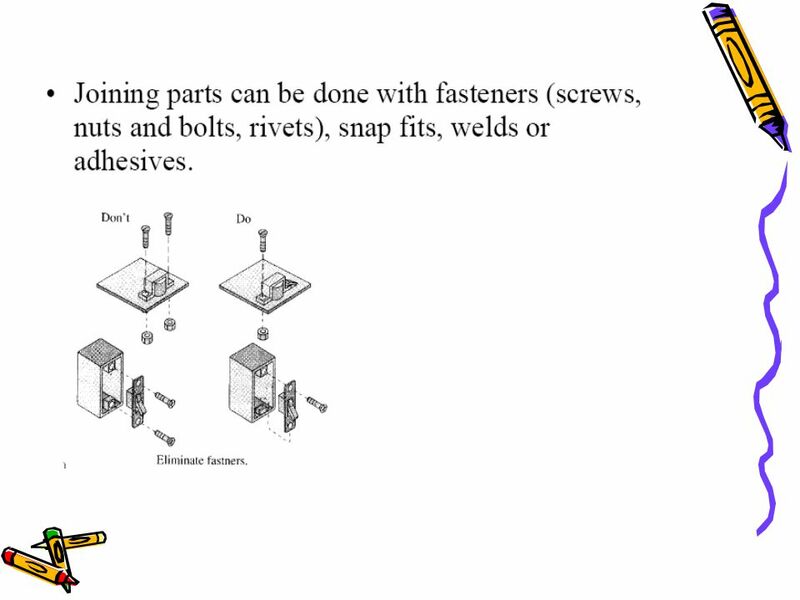 2.What are used to evaluate an engineer’s.